Depending on your distro use the chkconfig or update-rc.d tool to enable/disable system services. Checkout their man pages for more info. where the "..." is whatever was after "start on" previously. This way, when you want to re-enable it, you don't have to remember what the "start on" parameters were. This will cause upstart to ignore any "start on" phrases earlier in the file. Slackware and Arch linux have similar methods of stopping/starting processes at boot, different than the Ubuntu and Redhat-style examples given above. In both Slackware and Arch linuxes, sh scripts exist in directory /etc/rc.d, typically one script per daemon, or one script per subsystem. For example, Slackware starts the Apache web server with a script /etc/rc.d/rc.httpd, called at the appropriate time during system startup with an argument of "start". Arch linux has differently-named scripts, but the same sort of thing goes on. To stop an Apache that got started at boot: /etc/rc.d/rc.httpd stop You'll need to be root. To stop an already executing apache, you'd execute /etc/rc.d/httpd stop as root. 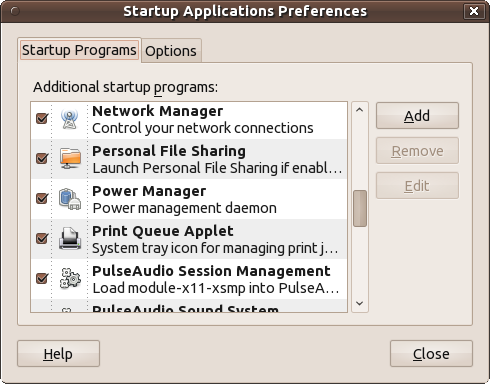 On Ubuntu 10.04 you can control some startup programs from the GUI. Almost every linux distributions use systemd for bootstrapping startup services. So above commands work for most of the distros. 1) tap superkey on you keyboard 2) search for 'Startup Applications' 3) choose which program you want to disable 4) hit like to this answer if worx. Not the answer you're looking for? Browse other questions tagged linux startup shutdown boot or ask your own question. What priority should I give to a script running on startup? Where should I put my C++ program to run at startup? How to stop execution of command from prompt in shell?